The sleek design of our Sydney vanities is constructed with solid wood. Each with an optional ceramic top-mount or vessel sinks, bringing a crisp contemporary look for your bathroom. Each door and drawer is crafted with Soft Closure designs, aimed towards fulfilling the serenity of your living space. White Quartz counter-tops depict elegance through a contemporary smooth look, coupled with either a vessel sink or top-mount to match your style. The bottom drawers of this series provide adequate storage space for daily bathroom necessities. Detached matching Side Cabinets are available for additional storage needs if suitable. Completing this set, is a matching framed wall mirror which features the same beautifully rich colors of vanity’s colors; expressing the exquisiteness of the fine cabinetry which is available in a few different colors and sizes. 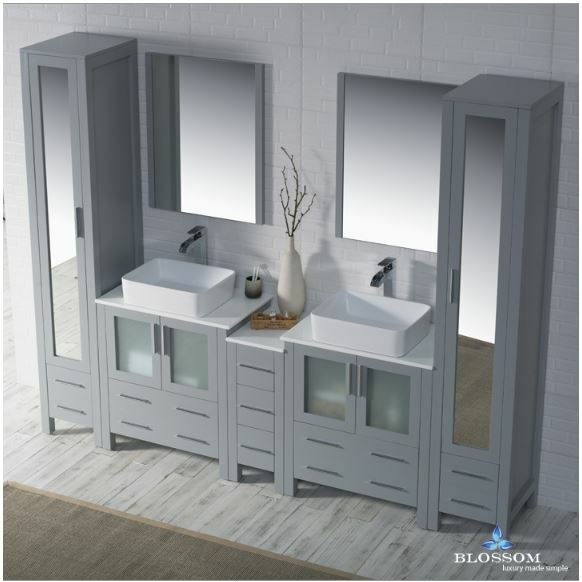 Mix and combine different sizes or Side Cabinets together to expand innovative ideas to your bathroom space.